Sandisk previously popped new Extreme III versions of its Memory Stick lineup, and now it's extended the tech to SDHC. The new family of cards can cope with 30MBps read/write data rates, a 50% speed boost over previous versions and a "new speed record" according to Sandisk. They're designed for digital cameras that have a high-speed burst mode, like the Nikon D90, and can safely capture "39 images in continuous shooting mode at 4.5 frames per second with a file size of 6.0 MB JPEG L Fine per image." You'll have to wait 'til October, and expect to spend $64.99 for the 4GB card, $109.99 for 8GB and a sizable $179.99 for 16GB. Press release below. TOKYO, JAPAN, August 27, 2008 – SanDisk Corporation (NASDAQ: SNDK) today set a new speed record of 30 megabytes per second1 for SD™ flash memory cards with the introduction of the SanDisk Extreme® III 30MB/s Edition line of SDHC™ Cards. The new cards, expected to be available worldwide in September in 4-gigabyte (GB)2, 8GB and 16GB capacities, are designed to deliver peak performance when used with the new digital single-lens reflex (DSLR) camera, Nikon D90. The Nikon D90 is the industry's first DSLR camera to support SanDisk Extreme III 30MB/s Edition SDHC cards at increased performance. Featuring a 50-percent speed boost from previous 20MB/s cards, the new SanDisk Extreme III 30MB/s Edition SDHC card makes it possible to record 39 images in continuous shooting mode at 4.5 frames per second with a file size of 6.0 MB JPEG L Fine per image.3 The Nikon D90 camera captures high-resolution, 12.3 megapixel still images, and it is Nikon's first DSLR to offer movie recording capability. 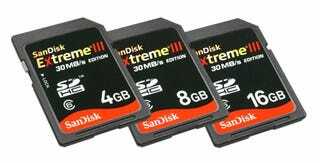 With ever-increasing technology advancements in DSLR cameras, higher megapixel growth and new video capturing capabilities, SanDisk Extreme III 30MB/s SDHC cards make it easy for consumers to capture and store more high-resolution images and video content. When placed in SanDisk's new ImageMate® Multi-Card USB 2.0 Reader/Writer, still images and video can be transferred from the new SDHC card to a computer up to 30MB/s, greatly reducing the waiting time to offload large files from the card to the computer. "The high capacities and performance of the SanDisk Extreme III 30MB/s Edition SDHC cards give users the freedom to shoot lots of high-resolution photos and video clips," said Susan Park, director of consumer product marketing for SanDisk's performance cards. "The combination of our new SanDisk Extreme III 30 MB/s Edition SDHC card technology and the Nikon D90 camera maximizes performance." According to research firm IDC, demand for DSLR cameras is growing as users replace older models with more sophisticated options. Global sales of DSLR cameras grew by 41 percent last year, which was nearly twice the growth rate of the overall digital camera market worldwide.4 "Increasingly we're seeing more second- or third-time digital camera buyers upgrading to more technologically-advanced prosumer DSLRs because they offer richer feature sets at more affordable prices than ever before," said Chris Chute, research manager of IDC's Worldwide Digital Imaging Solutions Group. "The new SanDisk Extreme III cards provide optimal performance levels and high-capacity points to match that latest technology innovation." "Whether capturing a special moment in sports, a wilderness hike, or just your toddler running across the room, life doesn't always stop when you want to take a picture. The combination of the new Nikon D90 camera and SanDisk Extreme III 30MB/s Edition SDHC cards helps ensure that photographers capture winning action shots and experience quicker transfer of files from the camera's memory card to a computer," said Mr. Koichiro Kawamura, General Manager, 1st Designing Department, Imaging Company Nikon Corporation Beyond their high capacities and performance levels, all SanDisk Extreme III cards are capable of functioning in extreme temperatures, from -13 to 185 degrees Fahrenheit or -25 to 85 degrees Celsius. The cards also carry a lifetime limited warranty.5 SanDisk Extreme III SDHC 30MB/s Edition cards, which have a Class 6 performance rating, are fully backwards-compatible; working in any camera, card reader or other device that supports SDHC cards.6 Pricing and Availability SanDisk Extreme III SDHC 30MB/s Edition cards are expected to be available worldwide in September. The manufacturer's suggested retail price is U.S. $64.99 for the 4GB card, US $109.99 for the 8GB card, and U.S. $179.99 for the 16GB card.